POLIGNANO A MARE, Italy — Puglia has some of the brightest seas, most diverse art and architecture, most mouthwatering peasant cuisine and kindest people in all of Italy — including strangers who will go out of their way to lead you to one after another stunning beach on impossibly lapis-lazuli waters. “I said put it back, this is a natural park,” a stern father told his son. He was pointing to the octopus that sat with protruding eyes on the boy’s shoulders after being plucked from the crystalline waters at Natural Maritime Reserve of Torre Guaceto, just north of Brindisi. With more than 500 miles of coast on two seas, the Adriatic and the Ionian, Puglia has all sorts of gorgeous beaches. For white limestone cliffs spotted with the deep green of gnarled pine trees, try the southernmost tip of Salento. At opposite ends of this peninsula, I swam in the fingerlike cove of Porto Badisco, where legend has it that Italy’s mythological founder, Aeneas, landed, and I dove even deeper into history at Portoselvaggio, where remains of Neanderthal men were found. A few miles north, it’s all about sandy expanses, like Punta della Suina, where the setting sun turns the transparent water pink. But it’s Torre Guaceto that gets my gold medal — for the baby-powder white sand, the schools of silvery fish flitting from reef-like rock formations in pools of turquoise water, and the scent of pine needles drifting from the pristine forest that borders the beach. No other image says Puglia better than the trullo, a rural home that’s essentially a whitewashed teepee of small limestone slabs stacked without mortar, with a cone surmounted by pagan or religious symbols. They are scattered among olive groves and huge prickly pear cacti in the Valle d’Itria, inland in a triangle between Bari, Taranto and Brindisi. Of unknown origin and unique to Puglia, they date at least from the Middle Ages. 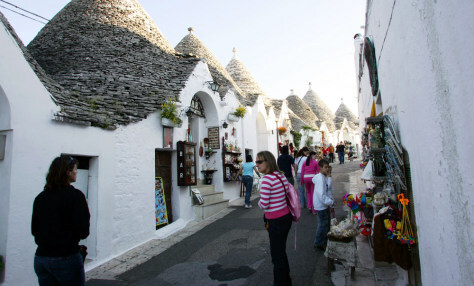 Most are still inhabited and more than 1,400 huddle in Alberobello. The town might feel a bit too touristy for Puglia, with its souvenir shops exhibiting plastic trulli, but it only takes a look at the clotheslines in a trullo backyard to realize that real life goes on in this primitive fairytale place. Farther inland is the Murge, scorched highlands grooved by canyons where, in the Middle Ages, people built cave dwellings as homes and churches when they fled from pirates. Art is not a masterpiece in a museum but a whole downtown in Valle d’Itria cities like Locorotondo, or, by the coast, in Bari, Ostuni and Lecce. Locorotondo is a round nest of a village where everything is white except for the bright splashes of red flowers that overtake its wrought-iron balconies. Ostuni is even more blinding, though a sea breeze caresses you as you hike up and down its steep inclines and marvel at the sculpted baroque portals on its whitewashed houses. But you haven’t seen Baroque in all its theatrical, indulgent, luxuriant excess until you’ve spent an evening among the wreaths of fruit and the pinup women sculpted on the golden limestone churches and palaces of Lecce. The busy port city is trying to overcome its dangerous reputation, but the only person that chased us in the narrow alleys was a grocery store clerk with a cold bottle of water, concerned that ours had become too warm as friends and I waited for another clerk to make our sandwiches. Medieval masterpieces are everywhere on the eastern coast, beginning with the inscrutable Castel del Monte. We know the octagonal castle was built by Emperor Frederick II, one of the most powerful men in the Middle Ages, in the early 13th century. But nobody quite knows why. Isolated on a small hill, it lacks both the architecture and the location for a military fort, and it’s way too imposing to be a pleasure palace. The most evocative hypothesis is that it was an intricate symbol, built around the magic intersection of astronomy, mathematics and the Christian faith. Traveling south, the Romanesque cathedrals at Trani and Otranto seem to rise from the sea. The latter’s floor is covered by a mosaic from 1165 representing the tree of life, a hopeful message in the site of a massacre — a chapel houses the remains of the 800 citizens who were slaughtered in the church where they had fled an assault by Islamic armies in 1481. 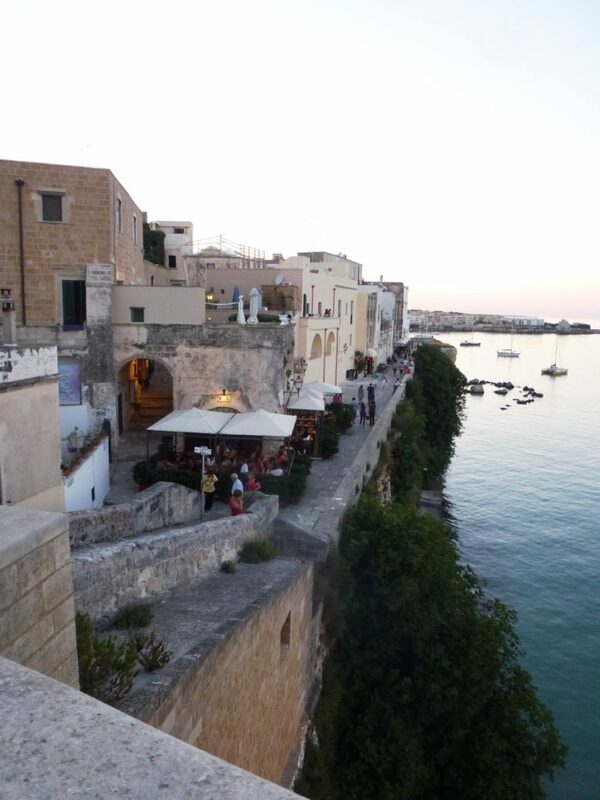 Puglia, like most of southern Italy, has been conquered over and over by northern and Mediterranean armies since Greek colonizers established flourishing city-states on its coasts. More than 2,500 years later, their heirs still speak Griko, a dialect of archaic Greek, in the inland Grecia Salentina. I’ll admit that the powerfully alcoholic red Salentine wine played a role in my dancing the pizzica pizzica, the local version of tarantella, one night in the streets of tiny Serrano. “I Linguini del Pescatore” (Fisherman’s Linguini) is fresh pasta with seafood, a typical dish in southern Italy’s Puglia region, near Lecce. But the food that went with it at the farmers’ fair was just as worthy of celebrating, including Puglia’s staple, orecchiette (ear-shaped pasta), as well as horse meat steaks, ciceri e tria (handmade tagliatelle with garbanzo beans), fave e cicoria (pureed fava beans and chicory), cakes spilling over with figs. Meat, grilled or cured, reigns inland, nowhere more spectacularly than at Cisternino in trulli land. At night, the absurdly numerous butchers of this whitewashed village set up tiny tables on the sidewalks and cook to order whatever you select from their marble counters, preceded by minuscule black olives, homemade cheeses and salami. Seafood, including delicacies like octopus and sea urchins, rule the coast in hole-in-the-wall trattorie like Nonna Tetti in Lecce. I had a hard time finishing pignata di polpo there, when the whole octopus was brought to me in a clay pot — especially since I had already had mozzarella di bufala, fried vegetables, and linguine with mussels. I needed similar endurance when gratitude compelled me to start my last dinner in Puglia with a humble pizza margherita. This must be the only region in Italy where the tomato-and-mozzarella staple of generations of students and workers still only costs about $2.50. Puglia is Italy’s top olive oil producer, so, for 660 miles back to northern Italy, I carried a three-gallon tank of thick olive oil in front of my car seat, sheltering it from the sun that for two weeks hadn’t stopped blazing and that pervades every facet of life here.